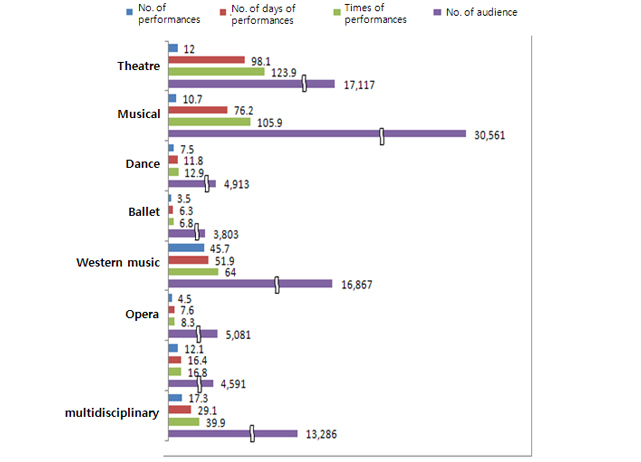 The objectives of the 2011 Survey on the Performing Arts were to gather statistical data concerning the state of current public funding for the performing arts sector flowing from administrative authorities responsible for public performance as well as the current operational practices of performing arts facilities and companies; ascertain the present status of the performing arts sector in an objective and reliable manner; and thereby provide basic data for establishing policies to galvanize the performing arts sector. The Survey on the Performing Arts was first conducted in 2005 on the areas of performing arts where structured data and information on practices in the performing arts field were then scarcely available, and it obtained approval from the Statistics Korea with respect to its statistical compilation in 2007 to ensure maximum objectivity and reliability of the survey. 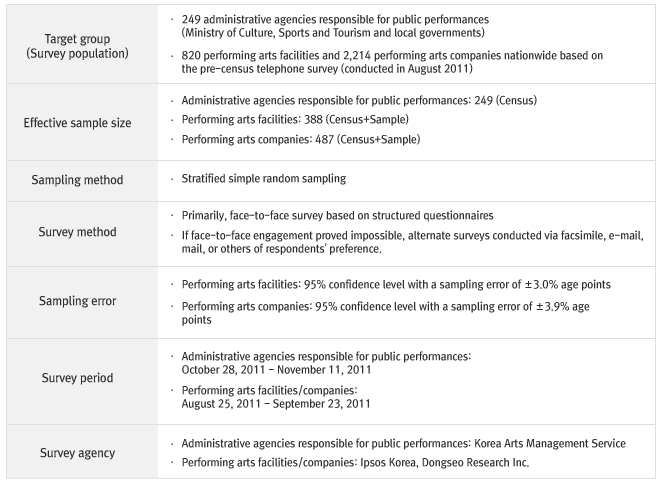 The survey population was categorized into five groups, i.e., national facilities, culture & art centers(funded by Ministry of Culture, Sports and Tourism), performance venues in the Daehangno district, others (public), and others (private), in order to allow for a sampling design that reflected characteristics of the performing arts market and to estimate its size. As for the analysis of survey data, the size of the performing arts market was estimated and its characteristics were analyzed so that the entire structure of the market could be put into perspective. Furthermore, in a bid to grasp in detail the actual condition of the performing arts industry, detailed analytical findings were presented as per attributes of public funding, performing arts facilities, and performing arts companies. Given the current situation wherein an increasing need for policies to invigorate the performing arts industry and sharpen its competitiveness is on the rise, the survey has focused on producing data of value that would objectively help in providing an accurate overview of the size of the performing arts market and the current state of the performing arts sector. This survey excluded the consumption (audience) area while exploring three key areas: funding, creation, and distribution. The central government and local governments responsible for providing public funding for the performing arts sector were surveyed in relation to the domain of funding while performing arts companies and performing arts facilities (performance venues) were inquired in relation to the creation (production) and distribution domains. Considering performing arts facilities and performing arts companies in 2010, the performing arts market was found to be composed of a total of 3,034 businesses, 56,798 employees, and sales of some KRW 549.3 billion. During the last four years, the number of performing arts facilities has increased to 820 in 2010 from 662 in 2007, up about 160 units. The number of employees rose to 9,623 in 2010 from 9,037 in 2007, up about 590 persons. Their sales increased from KRW 288 billion in 2007 to about KRW 327 billion in 2010, which recovered from about KRW 230 billion in 2008. As for performing arts companies that are surveyed every two years, the number of companies decreased to 2,214 in 2010 from 2,440 in 2008, down about 230 units. The number of employees also declined to 47,175 in 2010 from 80,517 in 2008. It can be inferred that the sharp decrease in the number of employees was primarily attributable to the substantial drop in the number of part-time performing members of these companies. Sales declined to KRW 222 billion in 2010 from KRW 232 billion in 2008, down about KRW 10 billion. The number of businesses of performing arts facilities increased 6.2% (or by 48 units) year on year, while that of performing arts companies decreased 9.3% (or by 225 units) year on year. The number of employees of performing arts facilities increased 2.5% (or by 231 persons) compared to the previous year, while that of performing arts companies decreased 41.4% (or by 33,342 persons) compared to the prior year. In the case of performing arts companies, the number of their performers declined 46.7% (or by 20,789 persons) and that of support personnel(staffs) decreased 17.5% (by 2,553 persons). As for the members, the decline in part-time members was more remarkable than that of full-time members. The change in the number of employees of performing arts companies is found to be significant over the years. Sales of performing arts facilities increased 22.4% (by about KRW 59.9 billion) year on year, while those of performing arts companies showed a decrease of 4.5% (by about KRW 10.3 billion) compared to the previous year. 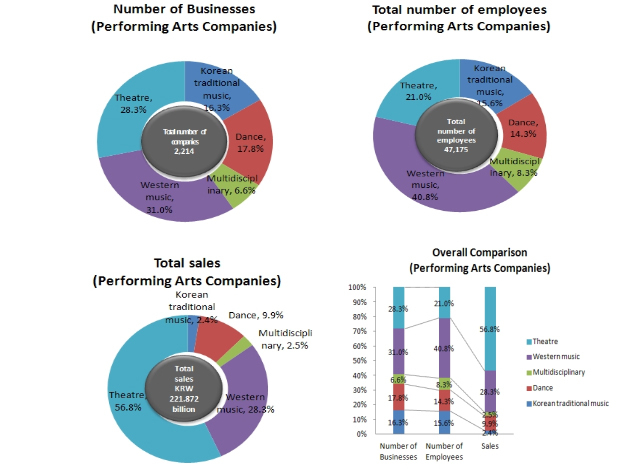 The survey showed that in the performing arts market, as for performing arts facilities, culture & art centers and other private facilities commanded larger shares than other performing arts facilities; and in terms of performing arts companies, theatre companies and western music companies represented larger components that other genres. 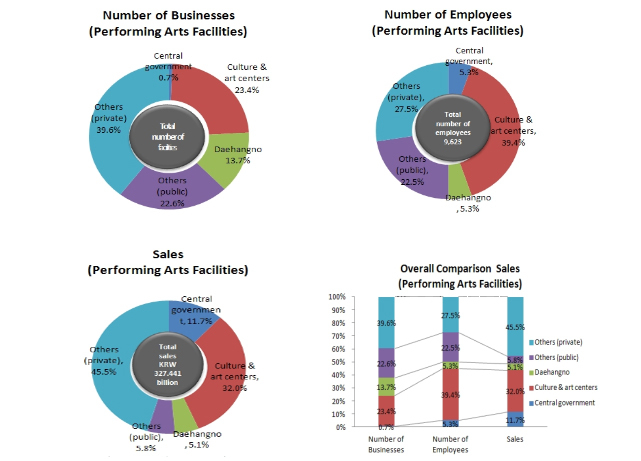 As regards performing arts facilities, in terms of the number of businesses, other private facilities accounted for 39.6% of all performing arts facilities surveyed, representing the largest share, followed by culture & art centers at 23.4%. In terms of the number of employees, culture & art centers commanded the largest share of 39.4%, followed by other private facilities at 27.5%. In terms of sales, other private facilities accounted for 45.5%, nearly a half of all facilities, followed by culture & art centers at 32.0%. Overall, central government facilities and culture & art centers comprised relatively high shares of the number of employees and sales, given their share of the number of units. On the other hand, Daehangno facilities were found to have relatively low shares of the number of employees and sales, given their share of the number of units. Other public facilities showed a high share of the number of units and number of employees, but a relatively low share of sales. For other private facilities, their shares of all three categories were high overall, but their number of employees commanded a relatively low share while their sales accounted for a very high percentage. As regards performing arts companies, in terms of the number of businesses, western music companies and theatre/musical companies accounted for 31.0% and 28.3%, respectively, representing higher shares than other companies. In light of the number of employees, western music companies made up 40.8% of the entire group. In terms of sales, theatre companies comprised 56.8%, more than a half of the entire group, whereas western music companies commanded a relatively high share at 28.3%. Overall, the portion of theatre/musical companies’’ sales among the entire group was high given the share of their number of businesses and employees. The portion of Western music companies’’ sales was relatively low for their portion of the number of businesses and employees. The shares of dance, Korean traditional music, and multidisciplinary genre groups are relatively small among all the performing arts companies. The proportions of sales of all three companies were rather small for the portions of their number of businesses and employees. The domain of public funding plays a crucial role in the performing arts market. The funding is provided in a variety of forms including subsidies for performing arts activities and festivals mostly offered to private performing organizations, and budgets for establishment and operation of national and public performing arts facilities/organizations. The performing arts budget that came from the central government and local governments totaled KRW 924.4 billion, of which the central government provided about KRW 147.7 billion and local governments about KRW 776.7 billion. The central government’’s budget for performing arts commanded 6.0% in its total culture budget, and 11.2% in its total culture & arts budget. The local governments’’ budget for performing arts accounted for 13.5% in its total culture budget, and 30.6% in its total culture & arts budget, showing local governments had a higher share of performing arts budget than the central government. In terms of usage of the performing arts budget of the central government that totaled KRW 147.7 billion, operation of national performing arts facilities commanded the highest share (54.2%), followed by operation of national performing arts companies (23.1%), establishment of national/public performing arts facilities (16.8%), and subsidies for performing arts activities and festivals (5.9%). In terms of usage of the performing arts budget of local governments that totaled KRW 776.7 billion, operation of public performing arts facilities accounted for the highest share (37.9%), followed by operation of public performing arts companies (21.5%), establishment of public performing arts facilities (21.0%), and funding for performing arts activities and festivals (16.7%). As regards genre-based performances staged by performing arts facilities, which are the key distributor in the performing arts market, an average of 11 musicals per performance venue were performed 106 times for 76 days for an audience of 30,561 in 2010. On average, 12 theatres per venue were staged 124 times for 98 days for an audience of 17,117. An average of 46 western music performances per venue were staged 64 times for 52 days and attended by 16,867 people on average. As for multidisciplinary genre performances per performance venue, on average, 17 works were performed 40 times for 29 days and viewed by an audience of 13,286. For other dance, ballet, opera, and Korean traditional music performances, an average of 4,000 to 5,000 persons per performance venue attended the performances. It was shown that performing arts facilities mostly staged works generally preferred by the public such as theatres, musicals, western music, and multidisciplinary genres, thereby leading to a high rate of attendance. Of the total revenues of performing arts facilities, public subsidies accounted for 55.4%, self-generated revenues 39.4%, and donations/endowments 5.2%. The reason for public subsidies comprising the largest share in the total revenues is that public performing arts facilities such as culture & art centers and other public facilities generally received a large share of public subsidies. Operating costs of performing arts facilities accounted for 67.4% of the total expenditures while working expenses comprised 32.6%. Of the total revenues of performing arts companies, self-generated revenues accounted for 38.3%, public subsidies 46.1%, and donations/contributions 38.3%. In terms of expenditures, working expenses took up 54.3% while operating costs accounted for 45.7%. The ratio of financial self-reliance is the total expenditure divided by the self-generated revenue. Amongst performing arts facilities, the ratio of private facilities such as Daehangno and other private facilities exceeded 70%, while among public facilities, government facilities was the highest at 38.6%, and other public facilities and culture & art centers were 20.3% and 20.2%, respectively. The ratio of financial self-reliance of culture & art centers was different depending on regions. Seoul was the highest at 45.1%, followed by Gyeongnam (32.0%) and Gyeonggi (26.2%), with other regions being less than 20%.